I hope you all are having a wonderful July 4th weekend. The mood at the Jelly Shot Test Kitchen is positively buzzy, and it has nothing to do with either holiday fireworks or high octane cocktails! What have we been up to? I, for one, have been pretty busy chasing down friends and acquaintance (and, sure I'll admit it - even a few total strangers) so that they may gaze upon the Jelly Shot Test Kitchen article appearing in this month's issue of Edina Magazine. (I am pleased to report that the response has been positive and of yet, no restraining orders have been filed!) Intermittent bouts of blushing and aw-shucks-i-ness have also been reported at JSTK - these are attributed to Editor Sarah Bauman's kind words, in addition to her delightfully breezy prose. A few weeks ago, when we posted about the Edina Magazine photo shoot, it was clear that Tate Carlson (photographer) and Bret Ryan (art director) were nothing short of Jelly Shot Whisperers. Now we have the photographic evidence to prove it. Just. Gorgeous. Don't you agree? From top, "The 78", "Ocean Margarita", and "French Lemonade" Jelly Shots. Here's a tiny shot of the cover - yes, that's right, those are Jelly Shots in all their glory! 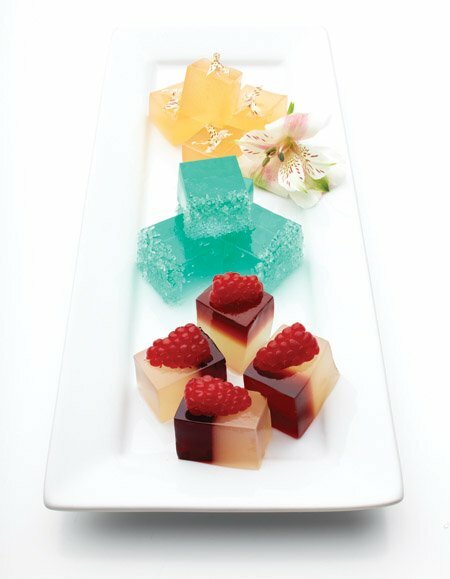 Mai Tai is in the front row - you can see Sea Breeze and Tequila Sunrise interspersed amongst the three featured Jelly Shot recipes (shown above). Thanks so much, Sarah, Bret and Tate! We loved meeting and working with you and all the lovely people at Edina Magazine and Tiger Oak Publications! * The recipes for The 78, Ocean Margarita and French Lemonade Jelly Shots are available via the article link, or the JSTK blog's recipe page.